← Fall Birthdays! Happy Birthday Anna Wight! Impression Obsession and MISTI Blog Hop! Welcome to the Impression Obsession and MISTI (My Sweet Petunia) Hop! Leave comments on the designer blogs listed below for a chance to win a $25 Impression Obsession Gift Certificate or a Mini MISTI!!! On Wednesday, October 12th we will draw from everyone who leaves a comment on ALL the blogs in the hop to give away both prizes. Winners will be posted on the Impression Obsession Blog, the My Sweet Petunia Blog and both companies FB pages. I started out with a background that I went a little too crazy with painting. I keep scraps like this because they are great for die cuts. I used and die cut the frame (DIE391-ZZ Ornate Oval Frame) and rooster (DIE273-Z Roosters & Chickens). Next I made “grass and sky” with my Mini MISTI and Wood Texture and D13494 Wide Stroke. 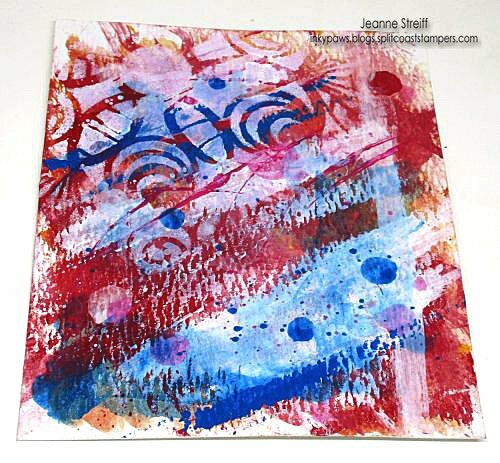 This entry was posted in All Occasion, Big Shot/Big Shot Pro, Impression Obsession, Inks, IO Dies, MISTI Tool, Mixed Media, Ranger Distress, Sizzix, Stamps, Tutorials. Bookmark the permalink. Well, that is very unique. Has a real homey look to it. Rustic elegance. A whole new genre! Wonderful job creating a striking fame and rooster! Awesome Jeanne – such a great way to get unique die cuts. I have to try this. Your card is perfect for a French friend… ;-)) ! Your coloring is really great, going crazy is a good idea !!!! I like how you made the background with the combination of the two stamps. This is a cute card for any occasion. never thought to do that. Thanks. What a great way to use all those crazy technique papers we all have. Love! Oh, what a clever way to use up works of art that need a new purpose. I think this card is so charming. I love that rooster, too. Thanks for the inspiration. 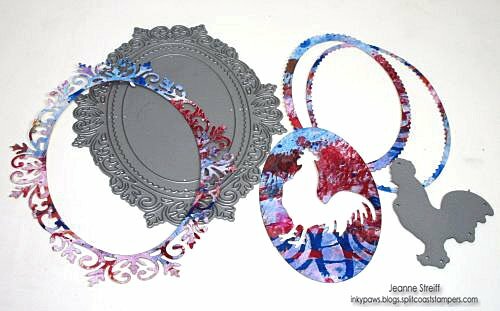 I love this idea of die-cutting scraps of art! I will be trying this technique! Thank you for the inspiration! If I win the prize, I might choose this oval die. It is beautiful! What a great idea… Adorable card… those dies are awesome.. love that the rooster and frame tie to gather from the same paper…. thanks so much for sharing and the chance to win. Wow! Great use of the die cutting, and a marvelous way of sizing everything together so perfectly! Thanks for the tips about using the “left over” paper for die cutting! While the regular size Misti is already in my tools, and dearly loved, I can now see that the mini Misti would be a fun addition as well! Thanks for the tips! Love your colorful card and especially your clever use of rejects! Wow…what started out as a mess really turned out great. What Great colors! Makes for a lovely card. That was a great use of the overdone piece of CS. I do that too. You can always find a use for things you don’t love. Really like how your card came out. So pretty!! Love the frame and the rooster!! Very pretty fall card..love those colors! Very fun card… I love how a tossed aside scrap turns out to be just the perfect addition! Love how the wide stroke stamp pulls it all together, too! I have so many projects that have gone south and this is a great idea to use them with die cuts! I keep them stashed away and sometime I bring them back to life. Other times I throw them away. Now I have another idea on how to use them. Thanks for the inspiration. Hey Jeanne, this turned out so great. Stuff happens when we are crafting but usually I can make it work on SOME project. I love how this looks! That is one cool rooster. I love your card. What a lovely original card. Gorgeous frame and a very pretty card!! What a great card! I’m going to look at my inked-up scraps with a totally different eye now! Very clever use for your wild painting. It made a very unique frame! I’m glad you showed the paper before you used it to die cut. I never would have picture that. Turned out great. What a great use for your inky scraps — got to remember this. wow what a great way to use “crazy” painted background. Excellent!! love the Misti!! Super background! Chickens and roosters are my FAVORITE! Oh eeekkkk! This is fabulous! 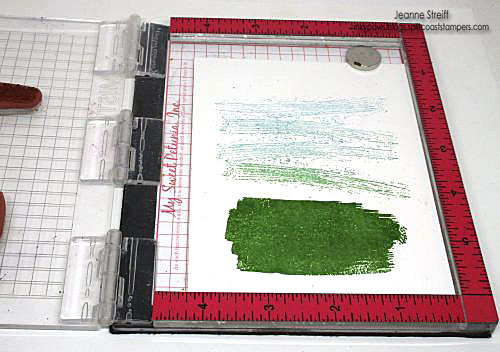 This is something I’m going to try right now with a couple of watercolor pieces I’ve been saving for something…. now I know what to do with them! Thanks for the inspiration! Wow, I love the rooster. What a unique way of stamping him. love the designs around the rooster and him too!!! Adorable card. Love the way you used up a background gone bad. I usually throw away will start saving now. Great ideas here. Lovely card…unique and interesting! I love the rooster! What a great way to use some of your other art work. Your dies look wonderful done in your painted page! Very unique card. Great ideas. I just love your card. I would have never thought of that! What a great technique you used with the Ornate Frame and Rooster! Keeping those backgrounds that aren’t used really saves time on another project. I love that you also added more color behind the images. I’m putting that ornate frame on my Christmas wish list. TFS! Neat background colors and very pretty die! OOh ! I love this mixed media type look. Also the non traditional color palette. Scraps of a wild background is great to use for die cutting. When die cut it totally look different. That really a gorgeous frame die. Thanks for the inspiration and your Card turned out Beautiful. Love your card! The rooster is darling. I just love the total package! Cute! I love your ideas, from painting the grass to using wild paper for the diecut frame. Can’t wait to play. Love your card, that rooster is strutting his colors! The wood texture looks good. Thanks for a chance to win. I love roosters. Great card and love how you made the master background. I’m glad you showed us how you made this cool card. Very artistic. Well done. Wow! What a brilliant idea to use your painted card to cut out the dies. Great card! Love the use of the wild paper! The rooster looks perfect! The frame on this one is wonderful. Love this card! Oh Wow! this is amazing! love the unique background, so colorful and eye catching! Awesome card! Love the paper you designed. What a great card. This is fabulous. Love the rooster and how you used this great background for the die cuts. Love the frame and rooster! Awesome colors! Very rustic looking card. I like how you used your scrap paper to cut out your dies. I am a huge fan of not wasting our precious and costly materials. Great job!!! Love the abstract art that you used to carve out regular dies. Gave a whole new meaning to die cuts. Love the French Country look of this card ~ lovely colors! Thanks for sharing your ideas and a chance to win some great prizes! Lovely colors and a very different look. This is a beautiful card — – your color combinations are so skillfully blended! Okay that’s it, I’m going through my scrap pile to look for some of those backgrounds that I discarded and then die cut them! What a great use of that background for this card. The rooster looks extra special strutting that bold mixture of colour, and the contrast of the grass is awesome! Thanks for sharing your ideas and talent. I like the way you did the background and die cuts are, indeed, a cool way to use those oopsies! Interesting use of the “background” to create the oval frame. Great idea. Love the card! What a unique and gorgeous frame and rooster! paper at hand that will work so well. 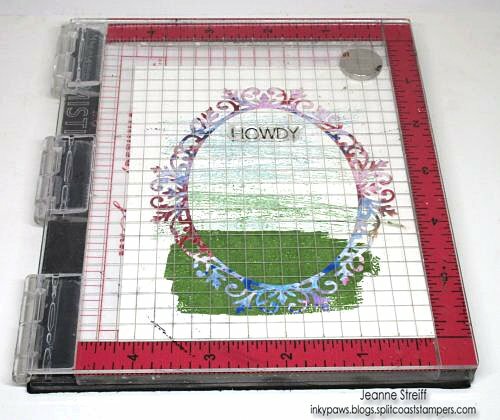 Great way to use your scraps for die cuts. Love how your beautiful frame and rooster turned out. Thanks for the inspiration! Interesting background. Just shows you that we don’t always need decorative paper. Love your card. The Misti really opens up a whole new way of stamping!!! Love the rooster. Very cute card. Crazy can be fun. What a lot of work but it was sure worth the result! Thanks for taking the time to show off these products! 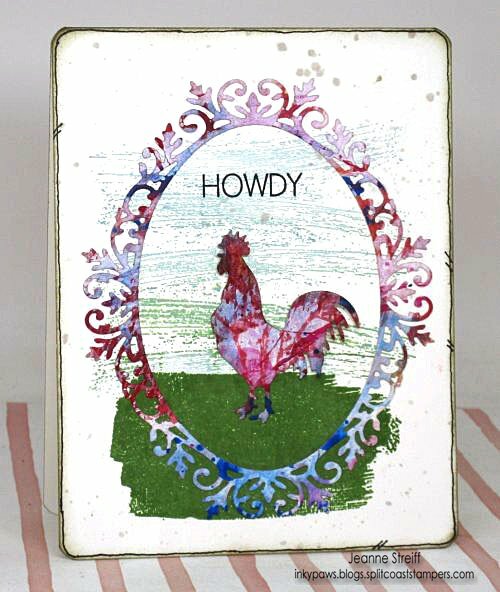 I love that multi-colored die cut frame and rooster so much! 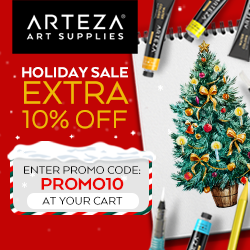 This is the perfect way to make your own customized patterned paper for projects! Great card. Thank you for sharing your ideas and being part of the giveaway. What a great way to use die cuts. Makes them so colorful! Wonderful card!! My IO wish list is always so long, but I think I’m going to have to add that set of dies to it. What a great use of backgrounds and use of stamps to enhance the card. I like how you created the stamped background and then die cut the oval and rooster from that! Nice card, thanks for sharing. Wow, this is a unique card. Love. So adorable. Like how you created the neat background first and then created your pieces from that. I have been reading all that I can find…want to start making my own cards to add a personal touch. Currently reading more than creating and need to take the plunge! Really cool card…love the rustic-ness of it! This was a very clever card. This very unique. There will not be another one like it. It would be a great card to show you care because it is a one an only card. so cute! love how you colored the diecuts! Great idea to use the paper for your diecuts, it looks awesome! I have never used a MISTI before but I have seen lately that you are loving it. 🙂 Would love to try it with my IO stamps. Thanks for sharing! I like how colorful your card is. This card has everything I love! Color, chickens (well, a rooster anyway!) and pretty die cuts! I think I may need a MISTI to add to my tool cabinet too! Wowzers! This is awesome! LOVE the paper you made to die cut and the background ROCKS!!! A Misti would be a godsend since I lost the use of three fingers in 2013 and have trouble stamping straight now!!! TFS! What a great card! Love how it all came together! Wow! What a creative use of leftovers. I really like your card. Love getting new ideas and techniques. So much inspiration! 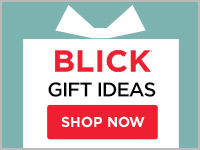 What a great idea to keep those “don’t like it” backgrounds and use them for die cuts. So smart! A great combination of techniques! Love it! I’m hopping in hops of winning a Mini Misti as I see it’s just perfect for multi card production! You frame turned out awesome. I need to be more free spirited and experiment. Really love that you were able to use that paper, looks great! I really like how you showed off all the different elements of your card, and how you used the MISTI. Good job. Wow, interesting design and techniques! A wonderful way to use the colors of another project. Love your layout. lovely! especially the colours. cockadoodledo!